Our first weekend in town, J was invited out by her co-workers for a going away party. We were still new to town and didn’t really know our way around yet. The bar they picked was Harvey’s on the Mall. We live right off Burdick Street, but didn’t know it, so we took Westnedge downtown and it took us a long time to actually find Burdick. We eventually did and that was introduction to the Kalamazoo bar scene. We didn’t know it at the time, but since then, I’ve heard Harvey’s had really good burgers. You should know by now how much I like burgers, so I really wanted to get back there and see what the menu was like. I’ve suggested it a couple times and J never seemed very interested. I finally asked enough times that she gave in. 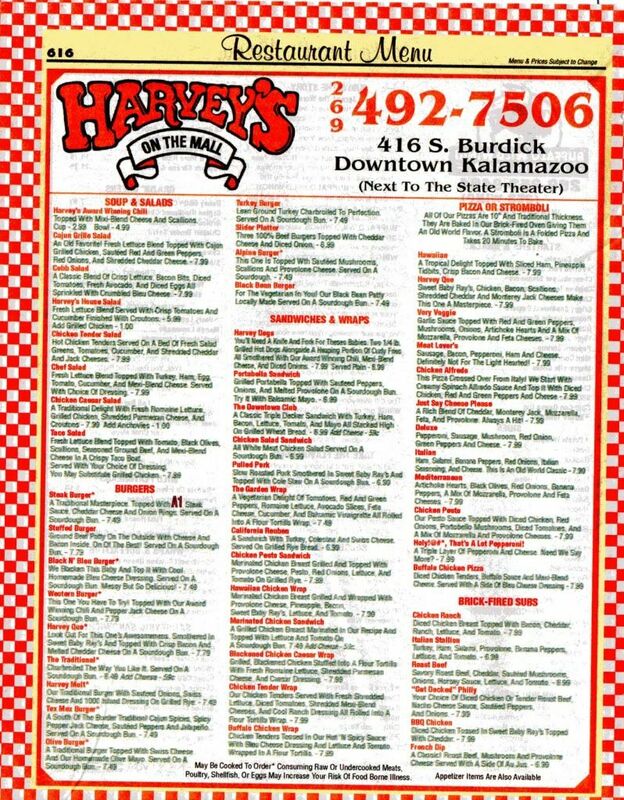 Harvey’s on the Mall is on South Burdick Street just south of Lovell Street at the State Theater. At first glance, Harvey’s is a pretty nice bar. You enter at street level and go up a short flight of stairs to the first floor. There is a bar in the center of the room and a hallway that sort of wraps around the bar. There are tables on both walls in the hallway behind the bar. To the area directly to the left there are larger tables and even a booth for a large party. There is another upstairs area that I have yet to see, but I here there’s a great beer garden up there in the summer. We showed up for dinner just after 6:00 on a Friday night and the place was packed. We sort of looked down the hallway when we first came in and didn’t see any tables. J suggested just sitting at the bar, but I told her to look around the corner to see if there were any tables on that side. We ended up finding a two-top along the wall. We sat down and right away a waiter peeked his head around the corner and saw us. Before we even got our coats off, he was there with menus and taking drink orders. Boring ol’ me went with a Coke. Wasn’t in the mood for a drink although they do have my beer of choice on tap (Pabst Blue Ribbon!). J is a lot more exciting than I am. She ordered the Harvey Hurricane which has SoCo, Captain Morgan, Malibu Rum, cranberry & OJ. The drink is served in a pint glass with a lime wedge. She said it was very strong and ordered an ice water so she didn’t drink it too fast. Dinner was obvious for me. I had heard they had good burgers and I’m always on the look out for good burgers. Now, I was faced with a choice. I was torn between two choices. The stuffed burger jumped out right away, but then I read the description for the Western Burger. I went with the latter. When I eat burgers, the patty is the most important part to me. I can tell the difference between a fresh pattied burger and one that came out of a freezer. Harvey’s was fresh. I asked for it medium and there was a perfect pink line right through the middle. It had a great flavor and fell apart in my mouth. It had everything I look for in hamburger meat. The rest of the burger was pretty amazing too. 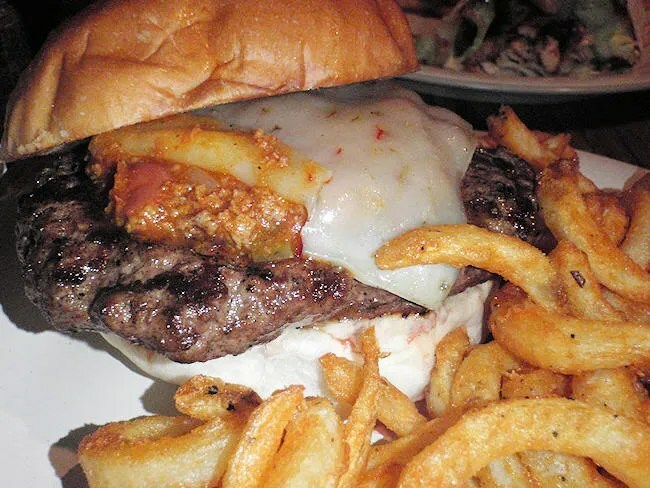 The Western Burger is served with a tangy chili and pepperjack cheese on a sourdough bun. I thought it was going to be super messy, but the chili was put under the cheese so the cheese actually held the chili in place. It was s delicious combination on the burger. I would have been happy eating either of them by themselves so putting it together was even better. The sandwich came with seasoned curly fries which were ok. Nothing super special. Some of them felt a little under cooked to me, but they weren’t horrible. J ordered the Hawaiian Chicken Wrap. 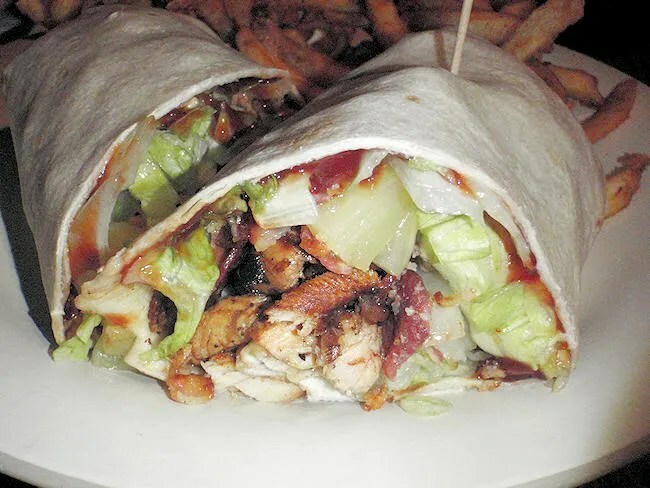 The tortilla was filled with a marinated grilled chicken breast, Provolone cheese, bacon, tomato, pineapple, lettuce, and BBQ sauce. She left the tomatoes out like she usually does. She was a huge fan of this wrap. She said the bacon added a little crunch. The pineapple added a little sweetness and the BBQ sauce melded all the flavors together. She totally changed her mind about Harvey’s with this wrap. As we were leaving, she said she would definitely go back to eat again. Her wrap also came with fries and she ended up giving a few to me. Our bill was just under $25 and that includes a six-dollar drink. The thing I really liked was the way our waiter treated the end of the meal. I finished way ahead of J. I’m not sure I took a breath while I devoured the sandwich, so I finished way ahead of her. I know there’s some conflict over how the server should treat this. Some people will say my plate should have been taken away right away. I don’t like that. I think it rushes the rest of the people at the table. He left the plate which is how I like it and allowed J to finish at her own pace. Harvey’s on the Mall has probably the best burger I’ve had since moving to Kalamazoo. Again, I’m amazed that readers of the Kalamazoo Gazette picked Red Robin as the best burger in town. 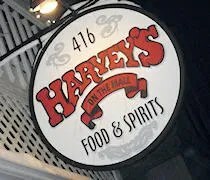 Harvey’s is a great bar and on top of that, it has great food. Great combination. 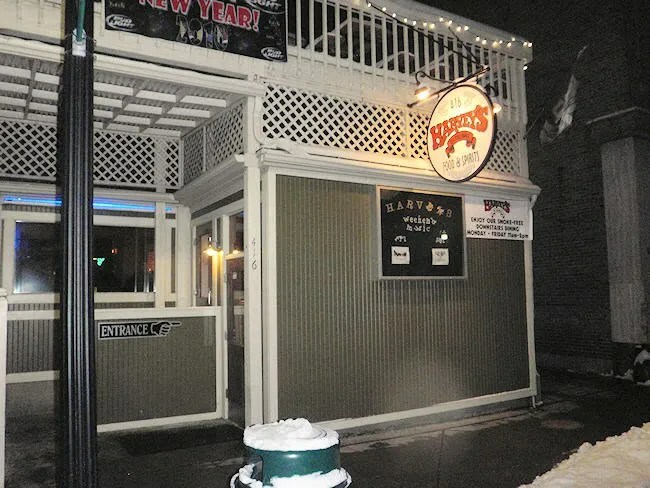 Harvey’s was my favorite Kalamazoo bar while I lived there. I’m going to guess that readers of the Kalamazoo Gazette selected Red Robin as the best burger in town because nobody reads the Kalamazoo Gazette! It probably got the one and only vote. Also, I swear they have pictures of all regulars past and present in back, because whenever I visit home, I walk right past the bouncer and people with me will get carded. I still know some of the staff, but it’s kind of crazy.